Elegant Classics Fruit. 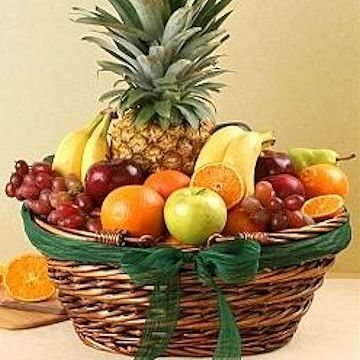 This fruit basket features a fresh array of delicious domestic and tropical fruits, such as grapes, apples, oranges, pineapple, mango, kiwi. Exact basket and fruit selection may vary by season and delivery location. Elegant Classics Fruit has been purchased most frequently by our customers for the following occasions: Get Well, Sympathy, Thank You, Birthday, and Thinking of You.